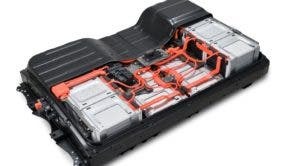 Lithium ion batteries and supercapacitors are both vital to the development of electric vehicles, but they often use liquid electrolytes that are flammable and can lead to explosions. Lithium ion battery and supercapacitor fires are not a daily occurrence, but they create a flood of news stories and spread concerns about the safety of electric cars when they do happen. In actuality, they are far less common than gasoline fires, which happen at the rate of 17 per hour in the United States according to Business Insider. The potential for fire means they must have some sort of thermal management system, which adds weight and cost. Creating a solid-state battery or supercapacitor that eliminates the potential of fires and the need for cooling systems is the Holy Grail of battery researchers around the world. The key is a fiber-like electrode framework that the team created using a process called electrospinning. The process deposits a carbon precursor polymer solution in the form of a fibrous mat by extruding it through a rotating electric field — a process that, at the microscopic level, looks something like making cotton candy, according to Science Daily. The ionogel is then absorbed in the carbon fiber mat to create a complete electrode-electrolyte network. Its excellent performance characteristics are also tied to this unique way of combining electrode and electrolyte solutions and allows them to make contact over a larger surface area. Science Daily makes the analogy to breakfast cereal. Corn flakes absorb milk more slowly than does shredded wheat because the latter has more surface area exposed to the milk. Not only is the supercapacitor electrode free of flammable liquid, the compact design is also more durable, and its energy storage capacity and charge-discharge lifespan are better than similar devices in use today. It is also able to operate at temperatures as high as 300 degrees Celsius, which means it would make mobile devices much more durable and less likely to become a fire hazard due to abuse. Moving forward, Kalra and her team will attempt to apply the lessons learned for improved supercapitor electrodes to battery technology. Then comes the hard work of transitioning the breakthrough out of the lab and into commercial applications. That process can take years and often fails. But the prospect of lighter, more powerful solid state batteries is exciting to think about.